Comfort and storage device for the rear passengers. Lower the rear armrest for a more comfortable position. 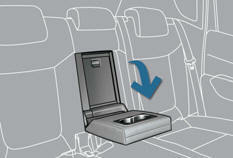 The armrest incorporates two cup holders.